Air jet system allows to increase the capture and containment efficiency of the hood. 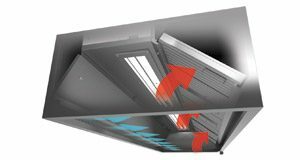 As a result, exhaust air flow rates can be reduced by as much as 20%. The air jets provide a dual effect: they stabilize and propel the rising thermal plume towards the filter bank and also help to confine effluents inside the hood volume. HPPD exhaust hoods come complete with high efficiency cyclonic filters. Filters exploit centrifugal force to extract grease particles with efficiency of up to 95%. Filters are made completely from 0,8 – 1 mm thick stainless steel and have a fully closed rear side. The design reduces fire hazard and ensures that highest fire-safety standards are met. Large number of accessories available, including recessed LED luminaires. Exhaust hoods are constructed from AISI 304 stainless steel. AISI 430 version is also available. Exhaust hoods come fully assembled. If a hood is ordered to include a luminaire(s), it comes fully pre-wired with an electrical box on the top of the hood. Upon request, an on/off switch can be integrated into the front panel of the hood.